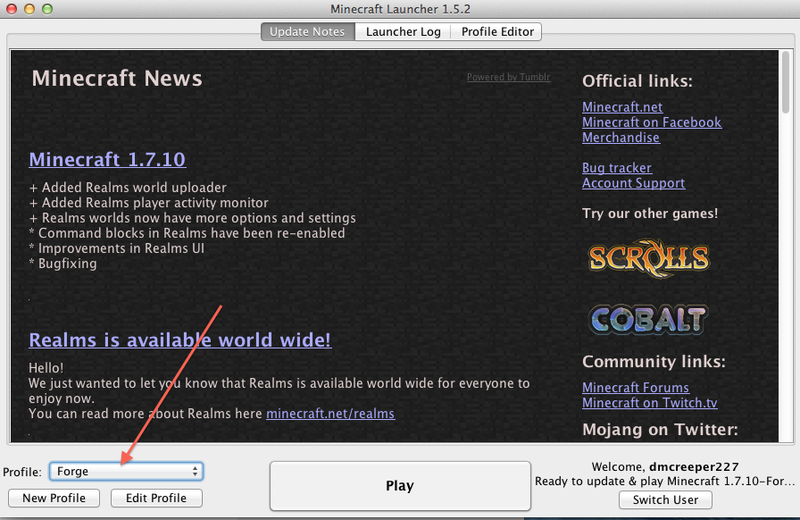 UPDATE: This post has been updated in How to install Minecraft mods on a Mac. My son is obsessed with Minecraft. He knows everything there is to know about the game, he has Minecraft toys, Minecraft books, he plays the game at school, and if we let him, he’d be at the computer all day and night 7 days a week. A few weeks ago he started asking for Minecraft mods. I had no idea what he was talking about so I looked it up and have since added some to his game. A Minecraft mod is an add-on for the game which you can download and that adds extra features and functionality. For instance, there’s a mod called TrainCraft which adds engines and tracks so that you can build trains. Mods are not made by the the company that owns Minecraft and consequently are unsupported by them. So if you install a mod and break your game, you’re on your own. I thought I’d write a brief guide on how to install mods on a Mac for other hassled parents out there. If you don’t have Java on your computer, you’ll need to get that first. Once you’ve downloaded Forge, navigate to the downloads folder, right-click on the file (it will look something like forge-xxxx-installer.jar) and choose “Open”. Make sure the “Install client” button is selected. Click “OK” and wait for the install to complete. Now you need to create a mods folder on your Mac. To do this, you need to find the Library folder in your home directory. Unfortunately this is hidden in Mac OS versions Lion, Mountain Lion, and Mavericks. If you’re using Mavericks, the latest version at the time of writing this, then the process is quite simple. Navigate to your home directory with Finder, then from the Toolbar select View > Show View Options. Tick the box next to “Show Library Folder” right down the bottom. If you’re not using Mavericks and/or don’t have the “Show Library Folder” option, then the other way to find this folder is to open it using a terminal. To do this, go to Applications > Utilities > Terminal. In the terminal window type: open ~/Library. Create a directory inside the Minecraft folder called mods. Now you’re ready to install some mods. Find a mod on the web, download the .jar file for the mod, and stick it in the Library/Application Support/minecraft/mods folder. That’s it! Now run minecraft. Before you click “Play”, choose the “Forge” profile from the drop-down box. If one of your mods crashes the game (this is not unusual), then you can navigate to your mods directory at Library/Application Support/minecraft/mods and put the suspect mod in your trash. 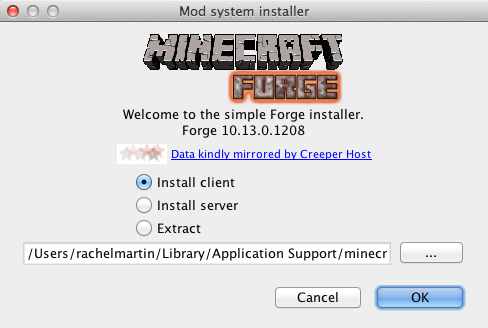 Posted in Minecraft and tagged forge, install, mac, Minecraft, mod, mods. Bookmark the permalink. Thanks, Denise. I’d never heard about Microsoft and the Xbox mods before. 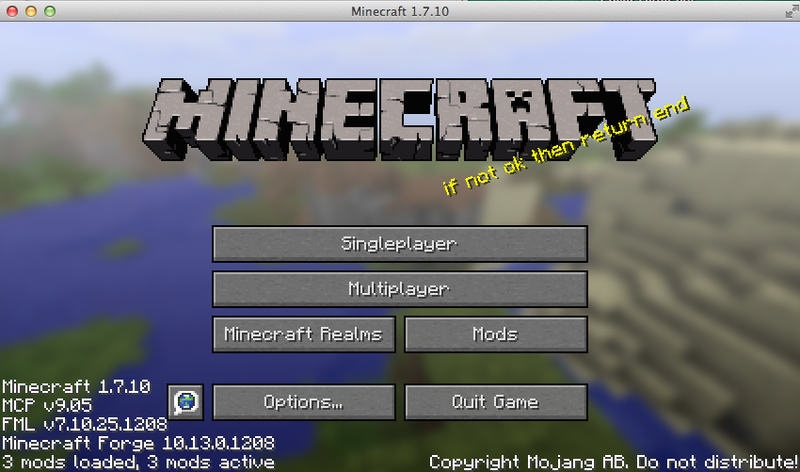 Gosh I hope Mojang don’t do the same thing with Minecraft. It was ridiculous at the time and I hope confined to MS and they won’t do it again! I’m hoping my son’s knowledge will exceed my own before too long. I’ve been trying to encourage him to learn to program but so far he hasn’t been all that interested. Thanks very much for that! Yippee! Our computer got pretty scrambled by Roblox and now my eldest daughter bought the mine craft app with the $20 app gift card we won in a raffle the other night…perhaps I need to send you the money I will save in techie fees in future! I’m sure your daughter will be hooked before too long. The Minecraft version for mobile devices is slightly different to the full desktop version and I don’t think it’s possible to install mods on this version. However it’s still a great game without the mods and it’ll take a while for your daughter to get to that stage anyway. Daniel started out with the mobile version too and that kept him entertained for a very long time. Oh, and as far as finding mods for MCPE, there are quite a few apps on google play that have mods you can download from the app itself. a few are fakes, but there are some good, legitimate apps that are out there. Thanks, William. I never knew. I’ll tell my son as I’m sure he’ll be really pleased to know. I don’t do games, but it was an interesting read… especialy about the 24/7 son, all kids are 24/7 at something, their energy is awesome. Oh god yes. They are full of energy. It’s exhausting! I play differt computer games… with that said, your son is lucky to have you do research in mods. You wrote an awesome easy to follow piece that if I were interested in Minecraft and mods, this would have helped a ton! What you need is the ‘[1.7.2] Geological / Volcano mod’. ‘Cause I wrote it.. The worst thing about mods is the prevalence of viruses, especially for windows machines, that come with the mods. And the fact that a lot of download hosting sites want to you go through layers of ads. You can, apparently, mod the PE edition, although it looks like you have to start messing with file systems in mobile devices. Not something I’d generally recommend. Oh wow. I’m very impressed. I’ll definitely install it! Is this the right place to get it – https://drive.google.com/folderview?id=0B9wQarGS8-7xUlBiVVJQRW1LTms&usp=sharing ? And do you mind me pasting the link here? Probably going to start work on improving it after a break. Partly so my kids can get their requests (have to work out how to make things explode, basically) and partly for code examples to show. this has been the most helpful mine craft tip i have read. My dad and I had been trying to get a mod for 3 days, but then we tried your directions and got the mod completely. Thanks so much for this! I am facing this exact same situation right now. A little voice begs for mods… has been for a few days now. I’m gonna try this. You’re welcome! I hope it worked out for you. Thanks Rachel! Plain english explanation and it works! Hi. Help please! I installed Forge. Downloaded a mod to my desktop. It’s a .jar file, not a zip. Can I just move the .jar file into the mods folder? Is there a way to change it to a zip file? Thanks for any help! Yep! That’s exactly what you want to do. Move the .jar to the mods folder and that’s it! Hi Rachel. I cannot thank you enough for this article. My son has wanted Minecraft mods for years, and as my computer skills are pretty poor, i haven’t been able to help him. All other tutorials i’ve seen has been for über geeks only, but yours was so easy and worked right away. Thank you!!! I have followed all the instructions and either mods crash on me – or they don’t load. Please help if you have any suggestions as what else I can do. Thanks.